Office sign with architectural logo. Graphic design by Peter Geist. 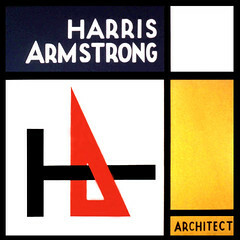 Armstrong's logo, the t-square and triangle, create an architectural symbol, while simultaneously forming his initials H and A. Peter Geist, an associate of Armstrong's, designed the sign for his office using a de Stijl palatte around 1947. The composition borrows a bit from Mondrian, but uses it to much different effect. Armstrong seems to have created the t-square and triangle symbol for himself in the earlier years of his practice. One of his trademarks was a desire to incorporate his initials into his projects where possible. This tendency shows up in early sketches from the 1930s through projects completed in the 1960s. Sign courtesy of the Harris Armstrong Archives, Special Collections, Washington University in Saint Louis. Peter Geist was my design professor at Washington University in the sixties. Now I'm in my sixties and still fondly remember our friendship. He instilled in me the love for good design and I am following in his rather large footsteps and teaching design at Syracuse University. He was a great designer and a wonderful person. The Armstrong logo is a fine example of his craft. 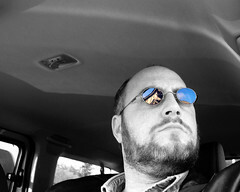 Thanks very much for your comment and information regarding Peter Geist. If possible, I'd like to find out more.